Shareholders got a late-year surprise in the form of major buyout news. Identity-theft protection provider LifeLock (NYSE:LOCK) posted market-thumping gains of 67% last year, according to data provided by S&P Global Market Intelligence. The stock had kept pace with the S&P 500 for most of the year following a sharp decline in 2015. However, a late-year spike ensured significant calendar-year gains for investors. The rally was sparked by news that Symantec (NASDAQ:SYMC) would be purchasing LifeLock for $2.3 billion, or $24 per share. Unlike many other cybersecurity stocks, Symantec posted improving sales growth trends last year in part because of its aggressive acquisition strategy. By purchasing LifeLock, the company aims to shore up its consumer-facing division even as it blows past its expansion targets on the enterprise side. "With the combination of Norton and LifeLock," Symantec CEO Greg Clark told investors in November, "we will be able to deliver comprehensive cyber defense for consumers." "This acquisition marks the transformation of the consumer security industry from malware protection to the broader category of digital safety for consumers," he continued. LifeLock executives see the combination as a valuable one, too. "We are very pleased to have reached an outcome that serves the best interests of all LifeLock stakeholders," CEO Hilary Schneider said in a press release. Symantec will be funding the transaction mostly with cash on hand, but also with the help of $750 million of new debt. The deal likely won't be material to Symantec's fiscal year earnings, as the company still expects to earn revenue of about $4.1 billion and non-GAAP earnings of $1.15 per share. 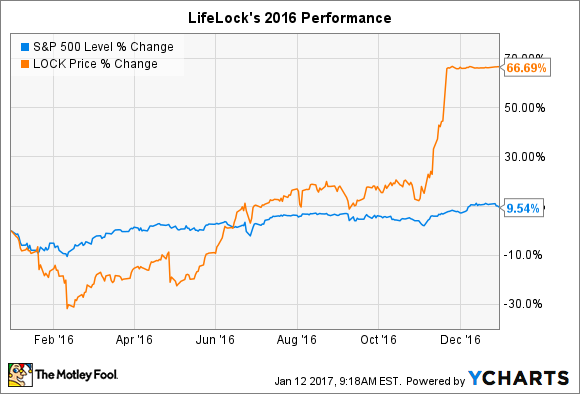 With LifeLock's stock valued at just below the acquisition price, investors are expecting the deal to pass regulatory hurdles and close right on target sometime in the first few months of 2017, ending a volatile 4-year run on the public markets for LifeLock.